Branson is constantly adding new and exciting limited engagements to our already amazing entertainment selections! Book your groups now for preferred seating! "The Kansas Pilot's Association is a group of pilot's who love to fly. We meet monthly in Wichita, KS on the first Tuesday of each month. We gather at the HomeTown Buffet for dinner and a meeting. Each meeting we have a speaker that talks about something dealing with aviation. We have approximately 70 members who enjoy the fly-outs that we have each month. Branson, MO. was selected for the month of October for a 3 day fly-out. We attended at least 3 shows, shop, eat and go sightseeing while we are there. 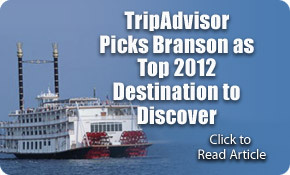 We appreciate the help of Branson Tourism Center and Valerie Yow for helping put this weekend together for us."